Sebastian Vettel claimed pole position for tomorrow's Turkish Grand Prix at Istanbul Park. If that sounds rather familiar, that's because it is: it's Seb's fourth pole from four races so far this year, the first time that's been done since 1999 (when Mika Hakkinen did it). 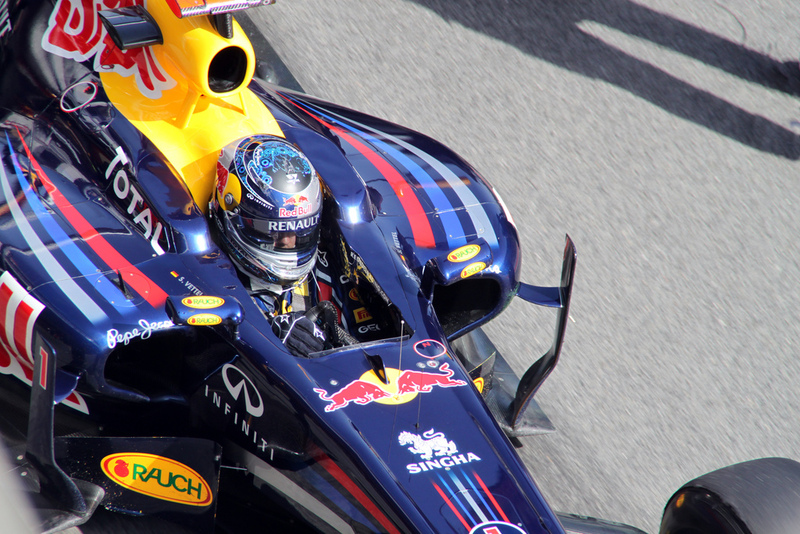 It was comfortable stuff for Seb, as it has been in every qually session this year virtually. Indeed, Seb was content that the time set from his first run in final qually would be sufficient for pole, sitting out while most of those behind him scrapped for the lower places. It was visual testimony to his dominance. For the first time this year Seb is joined on the front row by team mate Mark Webber, though the Australian will be less content with the four tenths of a second gap between him and the similarly equipped pole man. Both Red Bull pilots saved a set of soft tyres by only running once in the final session, so while the oppostion usually get a bit closer to the Bulls come race day, this factor will make it more difficult for the Bulls to be touched tomorrow. Another thing that happened for the first time this year was that it was Mercedes, rather than McLaren, who were best of the rest. Nico Rosberg confirmed the upswing suggested by his run in China by qualifying third. Schumi was again disappointing though, and despite getting into the final qually session for the first time this year lines up only eighth, upwards of a second shy of his team mate. Even with the presence of the mysterious 'magic paddle'. Ferrari also will be content that they've clawed back some performance compared with the front, with Alonso qualifying fifth, eight tenths down on Vettel (like Seb, it's the same qualifying slot for each of the four races this year for Fernando!). He'll be aiming for a strong finish to give the team's morale a lift, prior to their season-defining upgrade due in the next race, in Barcelona. Massa was strangely subdued though at a track where he usually goes well, and he'll start tenth after not even setting a time in the last qually session. McLaren complete the first three rows, with Lewis taking fourth and Jenson fifth. And well-deserved shout outs got to Vitaly Petrov, who starts seventh, again showing the extent that he's stepped up to the plate this year (he's again ahead of team mate Heidfeld, who starts ninth). And further back, Liuzzi performed a prodigy to start in twentieth place. He benefitted from d'Ambrosio getting a grid drop but he out qualified Glock fair and square. Credit where it's due to HRT as well, who seem to be edging towards respectability this year, having started the year in a cringe-worthy fashion in Melbourne.